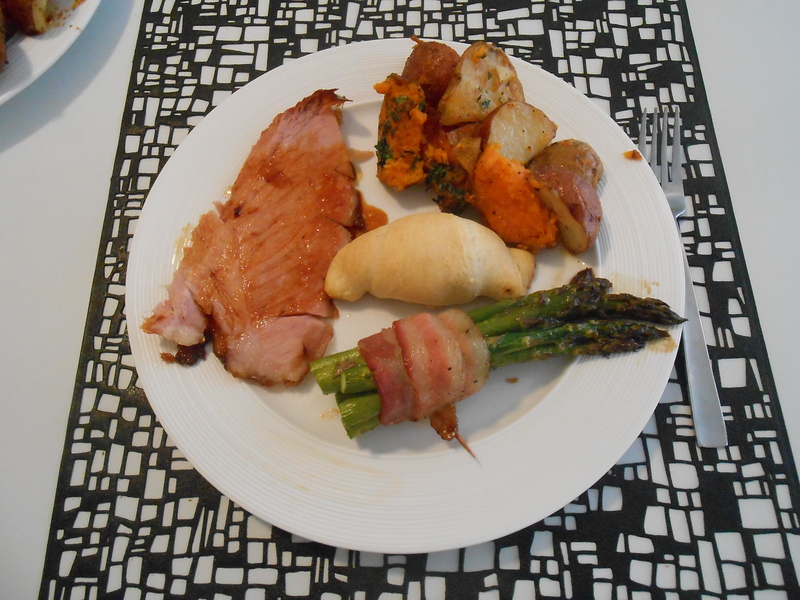 I typically use Easter as an excuse to make a ridiculously large meal for 2 people and this year was no exception. Not to pat myself on the back here, but everything was so good I’m definitely throwing it all into regular rotation at Chateau Annie. Even the ham was so easy (and of course made ridiculously awesome sammiches) that I think I’ll even make it on non-bunny days. Preheat the oven to 400 degrees F. Divide the asparagus spears into 12 bundles (I did about 6 per bundle). Wrap 1 piece of bacon around each bundle, starting about 1/2 inch from the bottom of the tips. Secure the bacon-wrapped spears with a toothpick then lay the bundles in a low-sided casserole dish. Next, in a medium saucepan, combine the brown sugar, butter, soy sauce, garlic salt and pepper and bring the mixture to a boil. 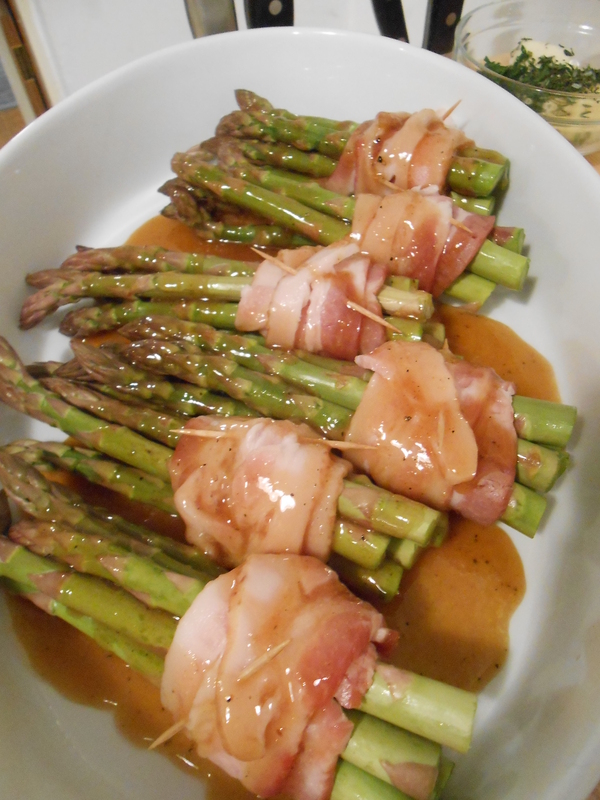 Pour the hot sugar mixture over the asparagus bundles. Transfer the dish to the oven and roast until the spears have begun to wilt and the bacon looks fully cooked, about 25 minutes. Remove the toothpicks before serving. This is a recipe I got foodnetwork. 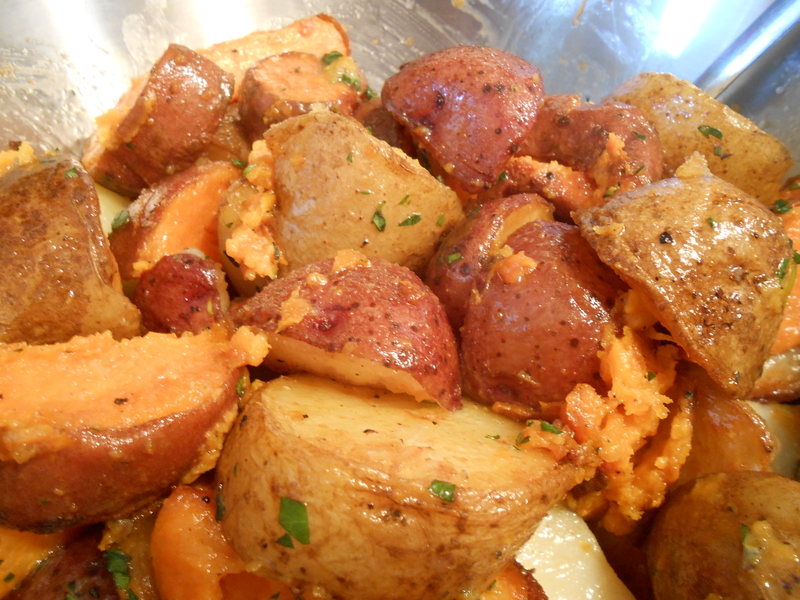 Cut the potatoes into 2-inch cubes then add to a large pot, cover them with water and add salt. Bring them to a boil, cook for 10 minutes, then drain and cool. The potatoes will only be partially cooked and should be completely dry before you roast them. Preheat the oven to 400 degrees F. Toss the potatoes with the canola oil and spread them in one layer on a baking sheet. Roast until crispy and cooked through, about 45 minutes. While the potatoes are roasting, make the herb butter: Mix the softened butter with the parsley, thyme and rosemary and add salt and pepper to taste, then when the potatoes are done, put them into a large bowl, toss with the herb butter and serve immediately. Snagged this one as well from foodnetwork. This was SO easy and SO delicious! 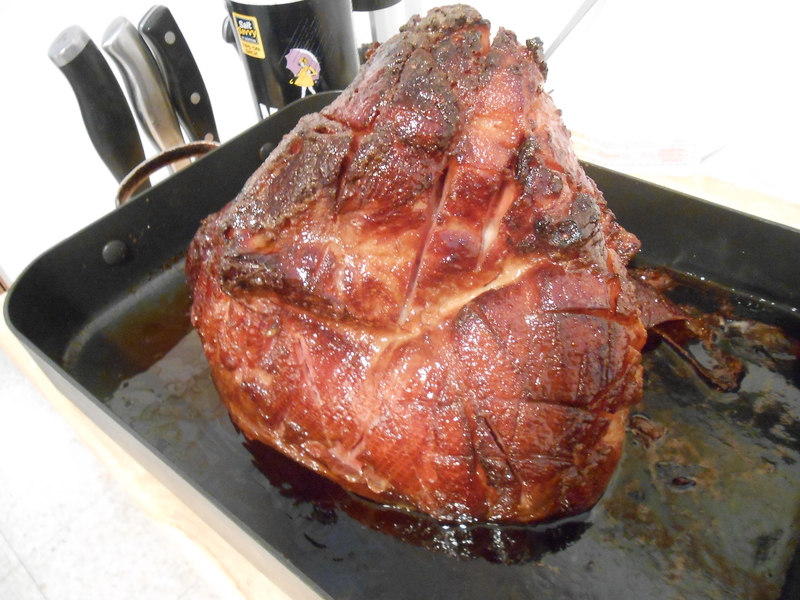 As we got a ham that was already cooked we just had to re-heat in the oven – this site is super helpful because it provides cooking times for every type of ham. For the glaze add the sugar and honey to a saucepan, cooking over medium heat until smooth and sugar is dissolved. 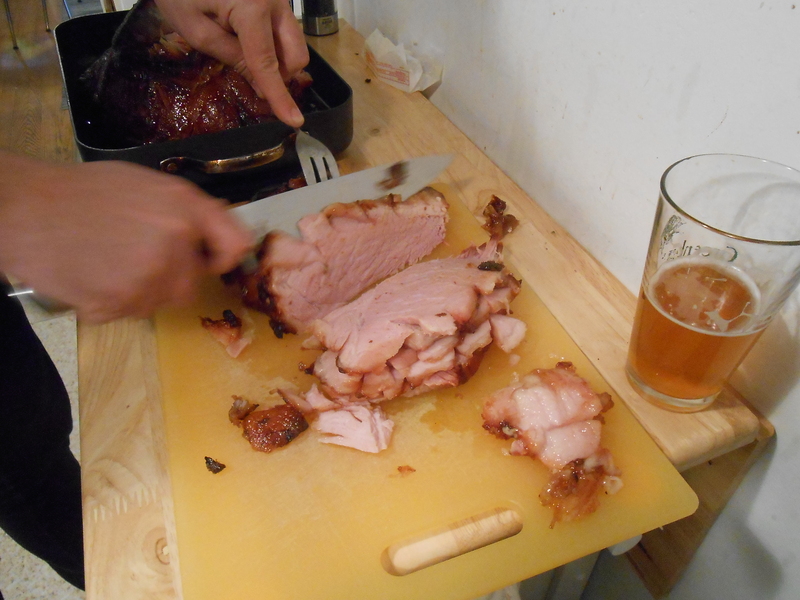 Pour the mixture over the ham and continue baking the ham, basting occasionally with the drippings in the roaster. Delicious!